Hopes&Fears answers questions with the help of people who know what they’re talking about. Today we ask the experts on why we want to flip the dinner table during holiday family time. For many of us festive season is far from a vacation, with the arrival of relatives, and endless to do lists; with event planning, shopping and organizing, enjoying ourselves often becomes the last priority. 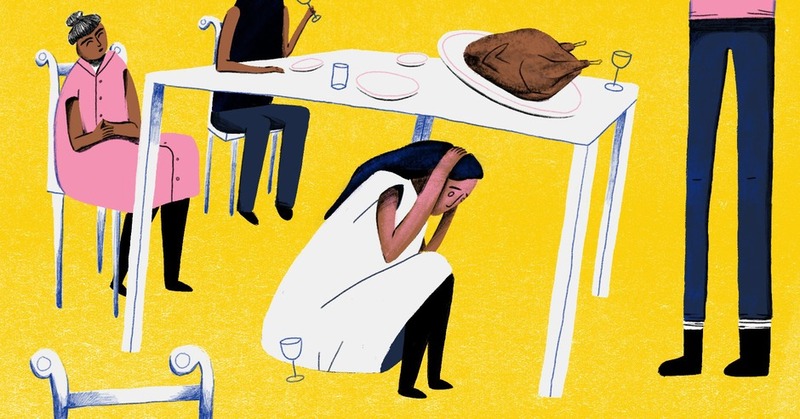 Even the tightest most loving families can become rife with anxiety when gathering for the holidays, creating a cheerful abundance of highly-strung individuals elbowing about the supermarket aisles and pulling out hair over pie. Why do we tend to stress out—and lash out—around those who should be closest to us? And how can we prepare to manage that stress? Hopes&Fears asked the experts their thoughts about why being around family stresses us out and what we can do to keep calm and pass the gravy. First, people set their expectations so high for a “Norman Rockwell” holiday based on what we see on TV and movies, and that’s a lot of pressure. Second, people are trying to be considerate of others and often overextend themselves and then feel resentful for it. Third people are afraid they’re not enough—either not doing enough, or not giving enough. Finally, people resent having to show up out of obligation instead of honest desire to spend time with others. Stress is simply a stimulus for change - it’s not good or bad, but it can become negative when the demand for energy is greater than our capacity. So, having family around during the holidays illustrates how something wonderful can actually be perceived by the brain as a “threat” when we feel like we don’t have enough time or energy to cope with the changes required to make it a festive and memorable holiday season. What often happens around the holidays is we start losing sunlight, which decreases our energy and can make us feel lethargic even without increased expectations. Add to that a diet that’s usually amped with sugar and caffeine, sleep schedules that are thrown off by travel or late nights celebrating, decreased movement and exercise from sitting around chatting, or changing our usual routines in order to cater to having company (or being company for someone else). This can cause us to be irritable and frustrated with the people we love because subconsciously we feel they’re taking up time and energy we just don’t have. Holidays—particularly Thanksgiving—are loaded with expectations and stories. We prime ourselves to be disappointed in each other because we hold on to expectations. And we make up stories about why the people in our lives either live up to or disappoint our expectations. This dynamic, when coupled with traditional holiday health chaos puts a tremendous stress on the body and mind. Cortisol from stress leads to insulin resistance. Add too much sugar, couch potato behavior and poor sleep regulation and you can't help but set yourself up to feel awful. Interestingly, especially considering this is Thanksgiving we're talking about, taking a few moments to actually experience gratitude is one of the fastest and most powerful ways to lighten that load, both physically (gratitude calms down the brain emotion center) and mentally. Presents and presence. If anything turns people into Grinches on the holidays, these two are the main culprits. Unless you’ve managed to remain close to your family after everyone’s flown the coop (and kudos to you if you have), purchasing gifts for siblings, parents, nieces, and nephews becomes just one more thing (of 100) to do during the busy season. It’s not the cost that causes the stress, but the fact that it’s become just something to tick off the list and not a true expression of gratitude of generosity. It’s compounded further in more dysfunctional families, when gift-giving comes with the threat of retribution for not doing so. But makes the stress all the more anguished is that the physical and emotional distance between family members comes with a commensurate gap in knowing what anyone wants. Indeed, it’s the stab in the dark when choosing a gift that produces most pain, as it reopens all the old wounds. The holidays can be stressful for very logical reasons—we travel which throws off our routine, we spend time with family which can be very triggering, we are spread thin with buying gifts, entertaining, and cooking, there's a host of financial stress with gift-buying and tipping. On top of that, we're meant to honor the natural rest cycle and shorter days by sleeping more in winter. Instead, we are busier than ever! It's no wonder that people get lots of colds and flus from running themselves ragged—the immune system is weakened from all this stress. Set priorities: Decide what's most joyful for you during the holidays; is it having the perfect gifts for all of your loved ones, baking, entertaining, trimming the tree? You don't have to tackle everything. This year, we'll get a small Christmas tree, I will get one gift (at most!) for my oblivious toddler, and my extended family is doing a Secret Santa so that I'll be choosing a special present for one person, rather than doing frenzied shopping for many. These small decisions all keep me from getting spread too thin. Say no to one event: There's a great New York Times article called The Busy Trap where author Tim Kreider makes a few interesting points. He says that our busyness makes us feel important, and the endless frenetic hustle is not a necessary condition for life. Rather it's something we've chosen, and we can choose differently. I challenge you to choose differently by turning down one invitation this week. Free up a pocket up time for rest and recovery. Nourish yourself: The holidays are known for indulgent eating. One way I protect my health is by starting my day with a superfood drink. It's full of protein, vitamins, minerals, superfoods, probiotics and adaptogens which are especially helpful in protecting the body from stress. I consider this my liquid insurance policy. When I start the day with a nutrient-dense protein shake, my cravings for sugar and carbs are greatly reduced, and I'm less interested in all of the cookies and sweets that are likely to cross my path during the holidays. I encourage all of my clients to start the day with protein, and to either drink a shake like this or be sure to take a good quality multivitamin each day. Recover: Our bodies are not meant to go-go-go. One way that I like to recover is by practicing 4-7-8 breathing, which is an ancient Indian technique to bring tranquility to the whole nervous system. I also like the Legs up the Wall restorative yoga pose. Over 80% of people are deficient in magnesium, which is considered 'nature's chill pill,' and an epsom salt bath is a good way to boost magnesium levels. Another way is to drink the Natural CALM magnesium drink. Finally, I like to spend a few minutes chilling out on my Spoonk acupressure mat - it's amazing! As I mentioned above, setting priorities is a good way to stay centered during the holidays. So don't feel you need to tackle all of the tips here. Choose one that resonates with you and implement it.